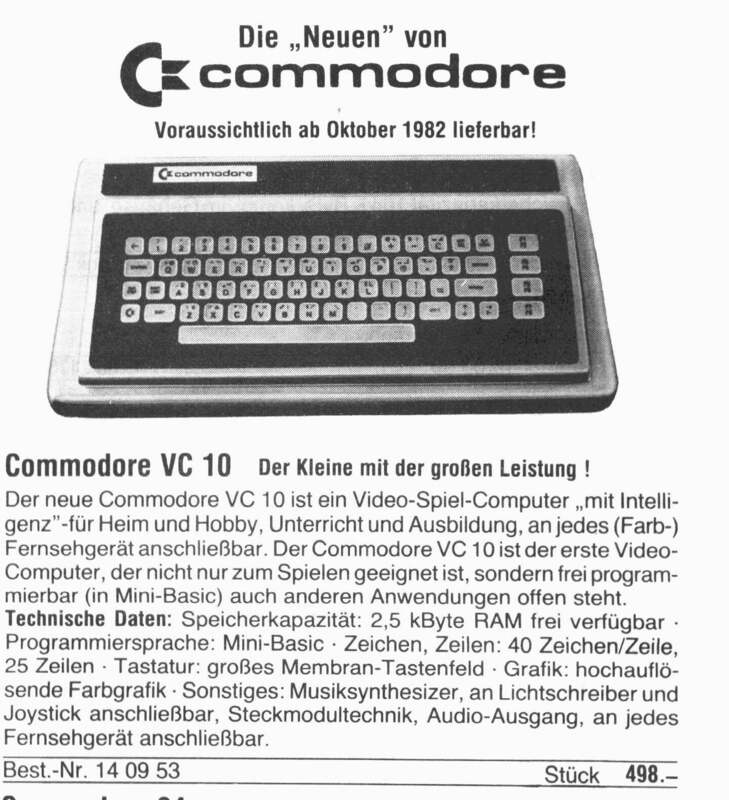 After the Commodore VIC-20 turned out to be a success, Commodore designed to create two new models: the VIC-30 (which was renamed to Commodore 64) and the VIC-10, which was a severely stripped down version of the Commodore 64. Here you will find the differences. My special thanks go to Thomas Hechelhammer who scanned a German advertisement featuring the VC-10. The advertisement says that the Ultimax would be available in late 1982. At about the same time, the Commodore 64 was released. Something I read about in one of those computer books from 1983, was the Commodore MAX. It cost $180 as opposed to the Commodore's $595. Game cartridges made for the MAX, yes, MADE FOR THE MAX, would run on a C64. I forget the exact specs, but it had not much memory and a cheezy keyboard. I've never heard of it until a week ago when I read about it. Yes, the Commodore 64 really costed that much, as it was released for the Christmas market in 1982. You can see the price listed in Commodore's Christmas demo written for the retail shops. As you see, there is only 4k of RAM in this configuration. The areas marked with "-" are open address space, just like the $de00-$dfff I/O area. The LORAM, HIRAM and CHAREN memory banking signals have no effect in this mode, but the video chip banking bits VA14 and VA15 do have. On a trivia note, the UltiMax mode is the only mode where the video chip can access any external memory. Of course no valid UltiMax cartridge would bank the video memory or use any memory above $1000, because it is unaccessible to the processor. What about the hardware of UltiMax machine? My assumption is that it had 4k of RAM, a 6502 processor (since the 6-bit I/O port is not needed for anything), one CIA (the $dd00 CIA is not needed) and no ROM. Actually, even the C64 works without the $dd00 CIA; you just cannot do anything that would require the 2nd CIA. But the most expensive chips, the VIC-II and the SID must have been there. I've seen reports that the UltiMax (or Max machine or VIC-10 (the C64 would have been VIC-30)) would have had 16k of RAM, but it wouldn't make much sense. You write that the MAX had a keyboard. Then the machine should have had KERNAL and BASIC ROM, but it still wouldn't need any memory banking bits in the processor. But it would have needed a 6510 and its I/O port for driving the cassette drive. If anyone has a UltiMax machine, then please let me know the video chip revision number. The oldest video chip known to me is an NTSC-M 6567 R5 6A from 4282 (owned by me).